NEW YORK, NY – Netherlands-based AVG Technologies, maker of popular free and premium Internet security software, this week officially launched its 2013 product line. The AVG 2013 lineup includes new versions of the company’s free and paid products, and additional enhancements to its security and performance optimization products. Along with an increase in performance and enhanced threat detection, AVG revamped the user interface of its flagship offering, making the security software compatible with touch-screen systems. The company also offers an interesting “Do Not Track” privacy feature in its free and paid products. The new privacy feature informs users on what Internet usage data and information is being collected, and provides the choice to block tracking directly or turn it on and off as desired. “We believe all Internet users are entitled to know how their online data is collected and used – and they should have possible solutions available,” said JR Smith, CEO of AVG Technologies, when the feature was first announced. • A new user interface that supports touch-screen and complements the design of Windows 8. • Improved performance by reducing the startup time by 26%, speeding up scanning time up to 36%, and a user interface that loads over 200% faster. • File reputation technology brings enhanced detection and reduction of false positives. • Multi-layered protection utilizes signature-based antivirus, heuristics, polymorphic-based detection and behavior-based threats detection. • Enhanced and simplified firewall lets users personalize their settings in order to protect their privacy and identity online. AVG’s CTO Yuval Ben-Itzhak demonstrated the AVG 2013 interface (below) at a launch event Wednesday in New York City. “With our AVG 2013 offerings, we kept simplicity and performance at the heart of our product development cycle while further enhancing industry-leading detection and removal capabilities to tackle the latest emerging threats to PCs and smartphones,” Ben-Itzhak said in a statement. • AVG AntiVirus FREE – Provides protection for surfing the web, emailing and social networking at no cost. 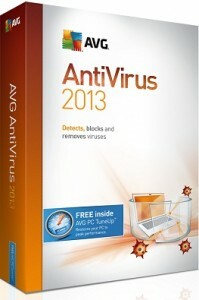 • AVG AntiVirus –Advanced protection for surfing the web, social networking and downloading. • AVG Internet Security – The company’s most compressive offering for online protection, securing activities such as shopping and banking. 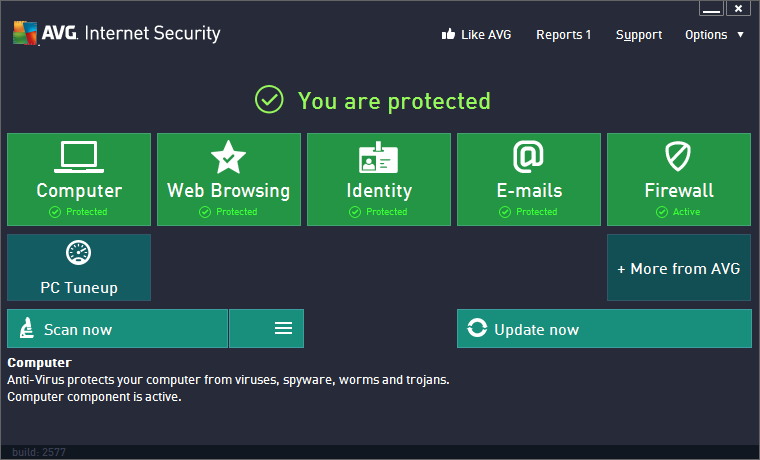 • AVG Premium Security – AVG’s highest level of protection with other features including advanced privacy controls and enhanced PC performance. • AVG PC TuneUp – works to speed up the PC by cleaning the hard drive, and reduces freezing and crashing. AVG 2013 offerings also include mobile security products including AVG AntiVirus FREE for Android, AVG AntiVirus Pro for Android, and AVG Family Safety® products for iOS and Windows Phone. AVG, which went public in February of this year, said that at the end of June, it had over 128 million active users. The company had revenue of $272.4 million in 2011, up from $217.2 million in 2010. While AVG’s Free offering can be attractive to budget-conscious consumers, businesses and those who regularly conduct transactions online or handle any sensitive personal or company information should opt for a premium security product that offers maximum protection against threats.